Researchers at the University of North Carolina at Chapel Hill have found that up to 90 percent of predatory fish are gone from Caribbean coral reefs, straining the ocean ecosystem and coastal economy. The good news? 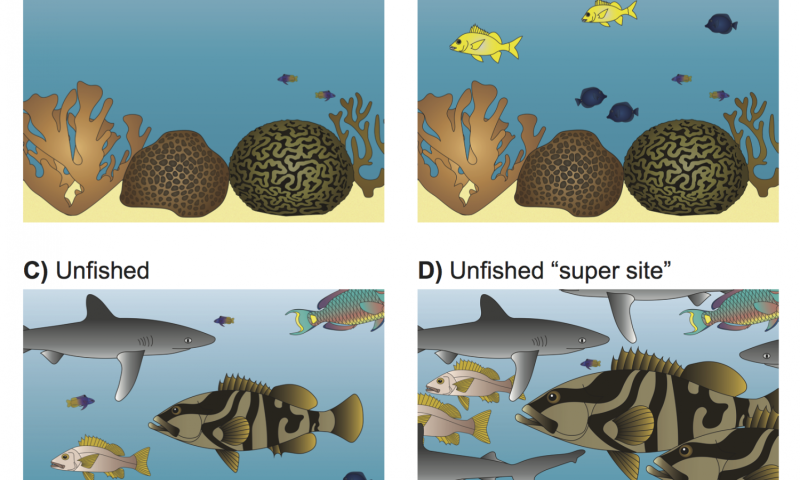 They identified reefs, known as supersites, which can support large numbers of predator fishes that if reintroduced, can help restore the environmental and economic setback inflicted by overfishing. The work, led by former UNC-Chapel Hill graduate student Abel Valdivia working with John Bruno, a marine biologist at UNC College of Arts & Sciences, suggests that these supersites - reefs with many nooks and crannies on its surface that act as hiding places for prey (and attract predators) - should be prioritized for protection and could serve as regional models showcasing the value of biodiversity for tourism and other uses. Other features that make a supersite are amount of available food, size of reef and proximity to mangroves. "On land, a supersite would be a national park like Yellowstone, which naturally supports an abundance of varied wildlife and has been protected by the federal government," said Bruno, whose work appears in the March 1 issue of Science Advances. The team surveyed 39 reefs across the Bahamas, Cuba, Florida, Mexico and Belize, both inside and outside marine reserves, to determine how much fish had been lost by comparing fish biomass on pristine sites to fish biomass on a typical reef. They estimated the biomass in each location and found that 90 percent of predatory fish were gone due to overfishing. What they didn't expect to find was a ray of hope—a small number of reef locations that if protected could substantially contribute to the recovery of predatory fish populations and help restore depleted species. "Some features have a surprisingly large effect on how many predators a reef can support," said Courtney Ellen Cox, a coauthor and former UNC-Chapel Hill doctoral student now at the National Museum of Natural History in Washington, D.C. For example, researchers believe that the Columbia Reef within the fisheries closures of Cozumel, Mexico, could support an average 10 times the current level of predatory fish if protected. Not long ago, large fishes were plentiful on coral reefs, but are now largely absent due to targeted fishing. Today, predators are larger and more abundant within the marine reserves than on unprotected, overfished reefs. But even some of the marine reserves have seen striking declines, largely due to lack of enforcement of fishing regulations. The bottom line is protection of predatory fish is a win-win from both an environmental and an economical perspective, explained Bruno. 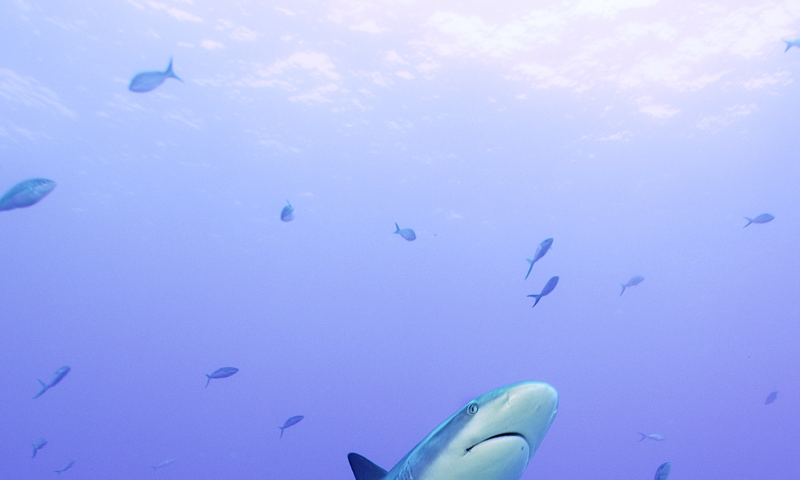 "A live shark is worth over a million dollars in tourism revenue over its lifespan because sharks live for decades and thousands of people will travel and dive just to see them up close," said Valdivia, now at the Center for Biological Diversity in Oakland, Calif. "There is a massive economic incentive to restore and protect sharks and other top predators on coral reefs." That would seem to be a good thing. You would think the prey species would rebound in a dramatic fashion. This in turn would attract the prey species to rebound in kind. It is common in the natural world for prey and predator to rise and crash in numbers in dramatic fashion, so even though the cause is human, it should cause a dramatic rise in prey because they do not know the difference between a Natural rise or fall in predators from a Human caused rise or fall of said predators. After all, we are part of the natural world. Would it be safe to say 90% off all fish are gone? You would think the prey species would rebound in a dramatic fashion. They cannot, they are also overfished.